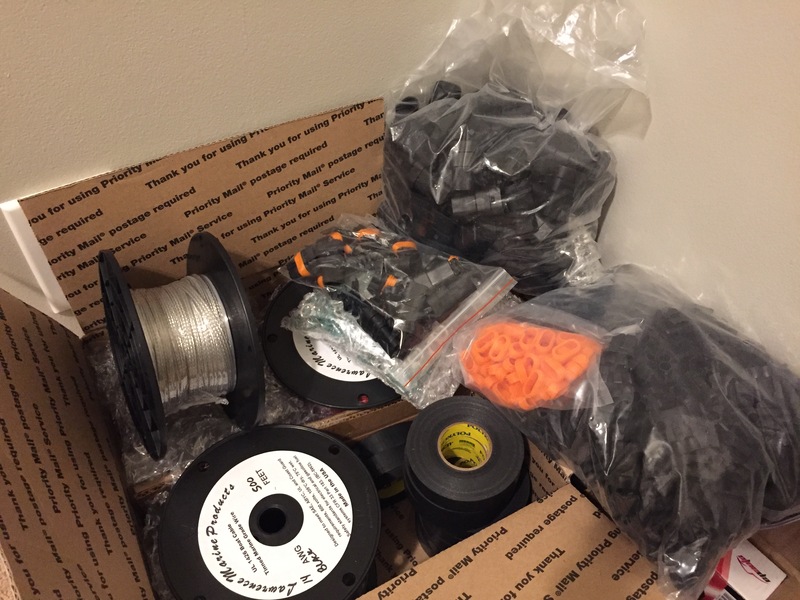 So both big shipments came early, so I decided to see how they are going to go together! Crimped on the output lead. Will need to set this up assembly line style so I don’t forget the weather seals! Crimping the male 9005 connectors. You really need this special crimping tool to do this correctly. 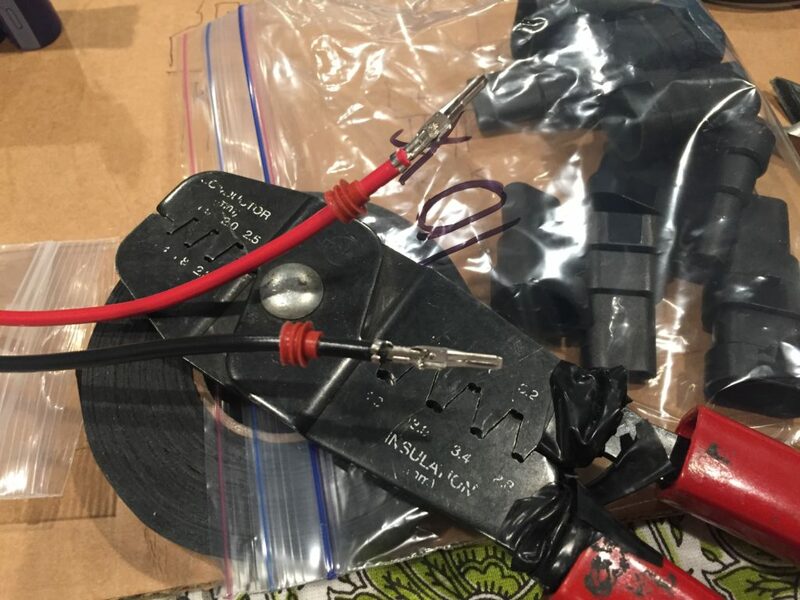 It folds the ends of tabs over into the wires for a secure bond. 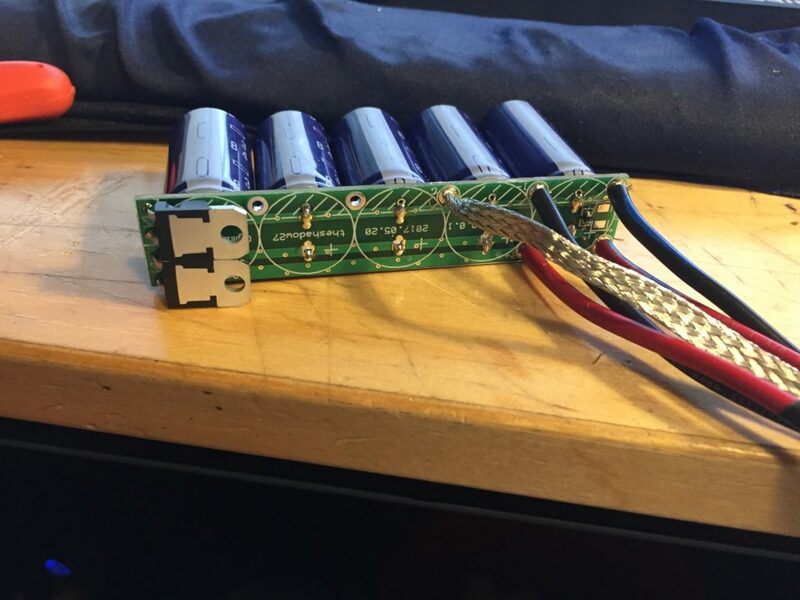 All soldered up (less the lead resistor, want to make sure it tests out first). Looking good! The holes are a bit tight for 14AWG wire. I will go a size up now that I see how much extra room there is in the cases. It all fits! Sort of. The diodes are wider than the case. 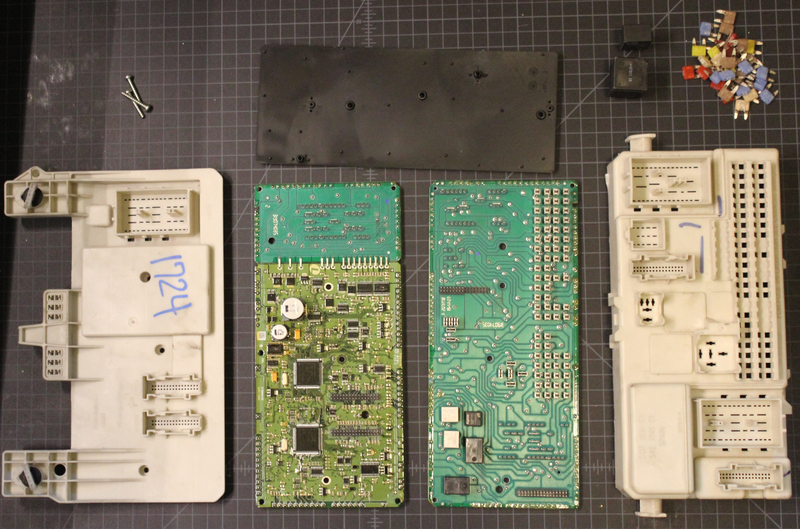 I will be able to use the prototypes PCBs by grinding away some of the internal case, but for the production PCBs I’ll re-arange the diodes so that they sit entirely within the case. Also, I’ll need to jig up the wire pass-through so that it is tighter-this one will leak epoxy like a sieve! Going to play with a few heat sink designs under load and see how well they do. This was my original idea, though I might wrap it around the bottom rather than around the edge. 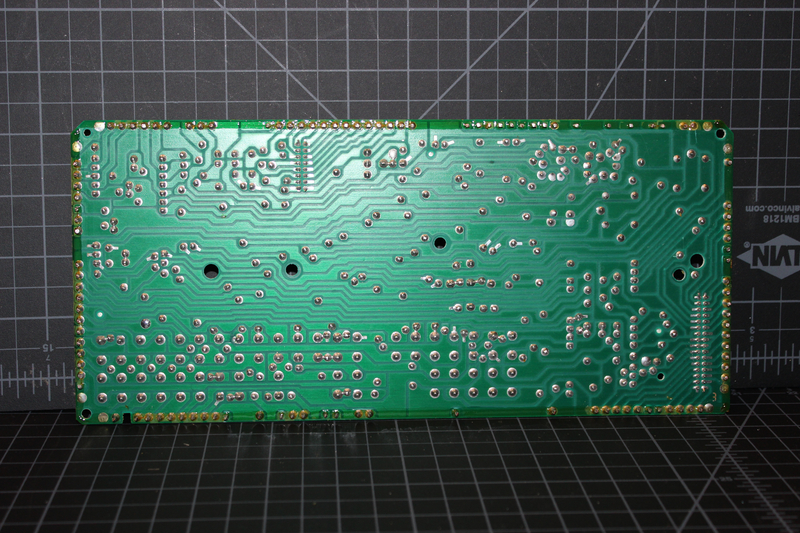 Also, once I get going with the new PCB layout I will drill and rivet the diodes to the heatsink. Here’s how the prototype heatsink sits when installed. 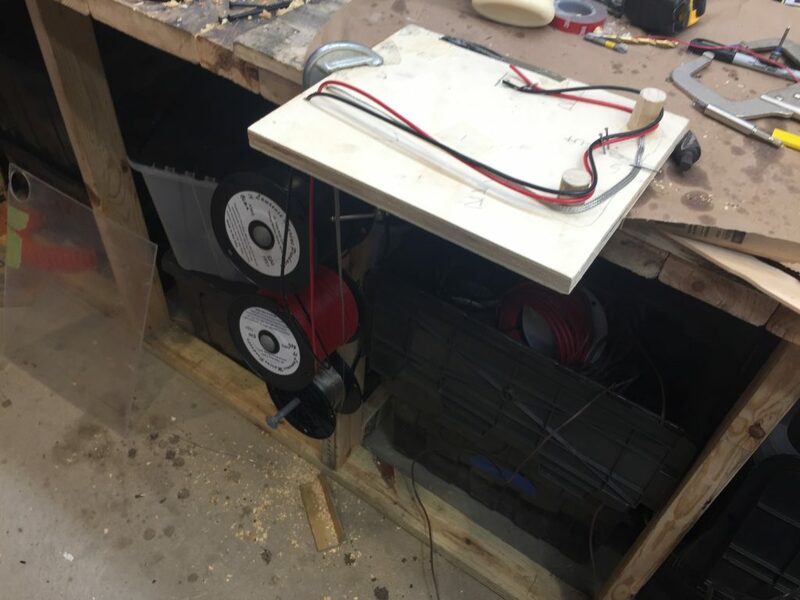 Back lid installed – everything fits inside! 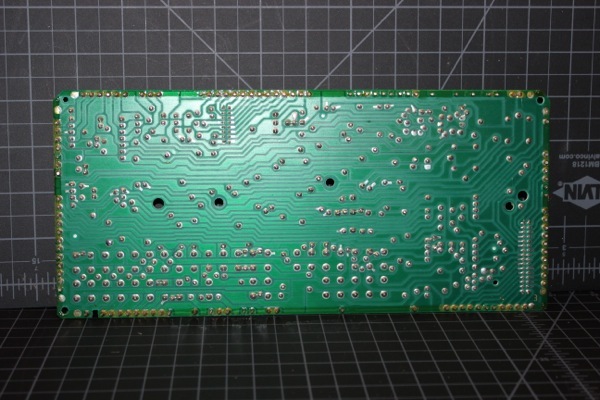 Need to touch up the PCBs and I will get the main batch ordered. Back to work!!! 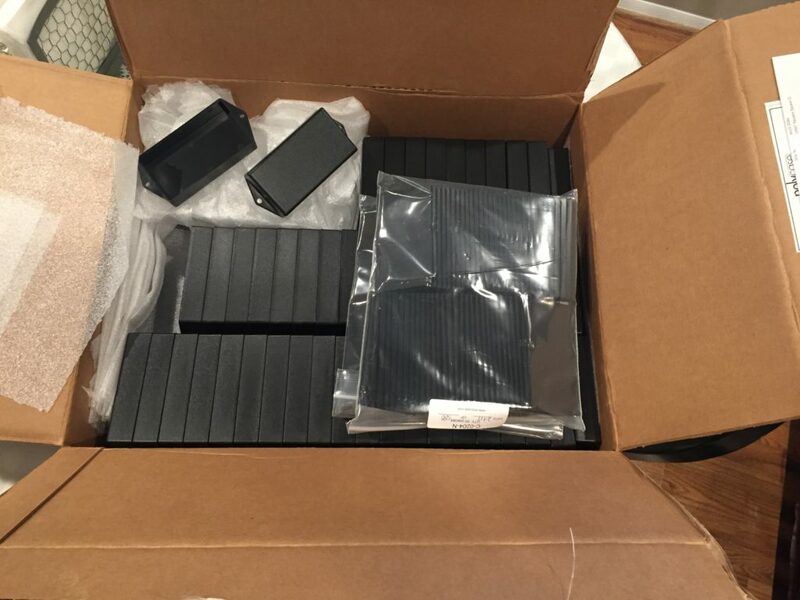 All parts have been ordered, which will be delivered before the end of the month, so it’s looking like all 14 pre-orders will ship out on time (as expected) – perhaps even ahead of schedule! Pre-orders will close at 11:59 EST on Sunday June 25th so make sure to get yours in by then if you want a SKBOWE before October! Will update further as parts arrive. Attention: This is an old post (June 2017)! Please see the retrofitting guide for up-to-date ballast recommendations. I have been reluctant to endorse specific manufactures, but so many people are asking that I will list a few here. Note that I don’t get kickbacks from any of these sites. A lot of the parts can be obtained cheaper elsewhere (especially if you are not in the US). I have personally ordered from all of the vendors listed on this page, so I feel comfortable recommending them, but do shop around (e.g. eBay) if price is a discouraging you from attempting a retrofit. There are two options for HID retrofits – reuse the stock projector with re-based capsules, or replace it with a full Bi-Xenon1 setup (e.g. E46) that uses D2S bulbs. 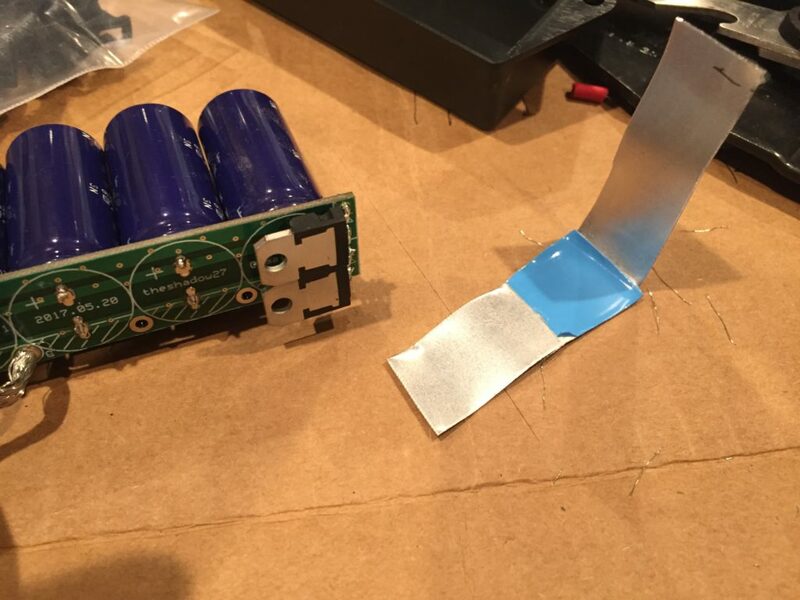 Learn more about projector retrofits from this great tutorial at TRS. After choosing rebase vs projector swap, you’ll also need to choose a wattage – either 35W or 50W. All automotive HID capsules are designed to run at 35w and are rated to last 2000 hours or so at that wattage. Driving a 35w capsule at 55w produces much more light output (+40%), but reduces the lifespan by 50% to 1000 hours or less. This is the easiest and cheapest option, basically, you install the HID capsule into your existing headlight projector, it fits in like a normal H11 (or H7 in Europe) bulb. Since the projector’s reflector/shield/lens was designed for halogen bulbs, you won’t get a super crisp cutoff or bi-xenon functionality, but it’s essentially plug-and-play aside from drilling one hole in the headlight access door for the pass-through grommet. Along with your SKBOWE, you need to order a standard HID kit, either 35W or 55W, for the type of low-beam bulb your car is fitted with. Please see the retrofitting guide for up-to-date ballast recommendations. HID50’s ULTRA kit – My personal favorite. I have been using these in my car for nearly 8 years. Have replaced the bulbs 4 times, and the ballasts once (after 5 years, the rated lifespan). Rock-solid dependable and very bright. Morimoto XB55 (AMP) – Everyone seems to love these. high quality, waterproof, reliable products. DDM 55W Slim – Not the highest quality, but a great price and a lifetime warranty. 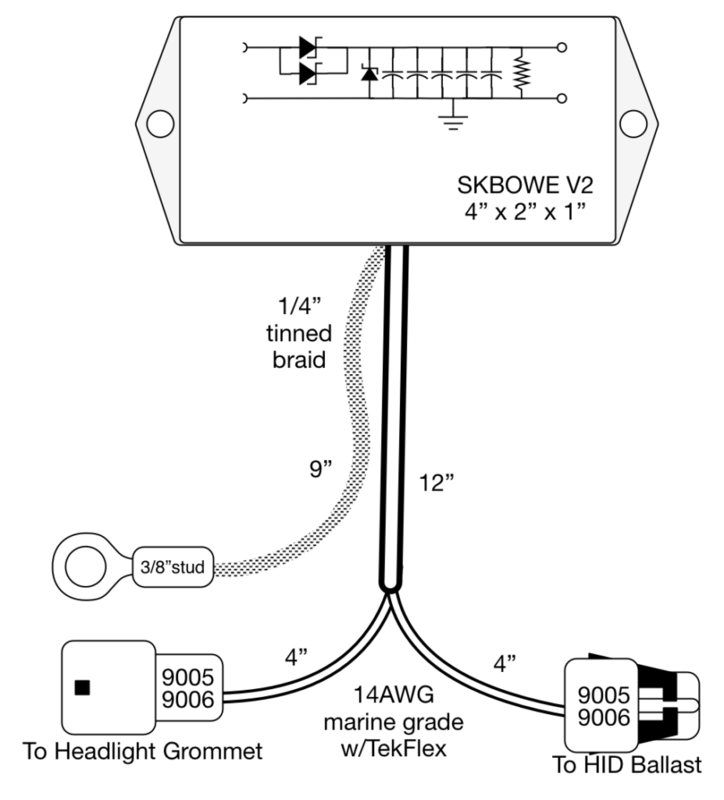 The SKBOWE will run these just fine… You’re spending nearly $100 on the error eliminator so that you can use any brand of ballast, if you don’t mind replacing them every 2 years (for free), the DDMs are a great choice. The benefits of using the stock projectors are that it is inexpensive, simple, and MUCH brighter than the stock halogen setup. 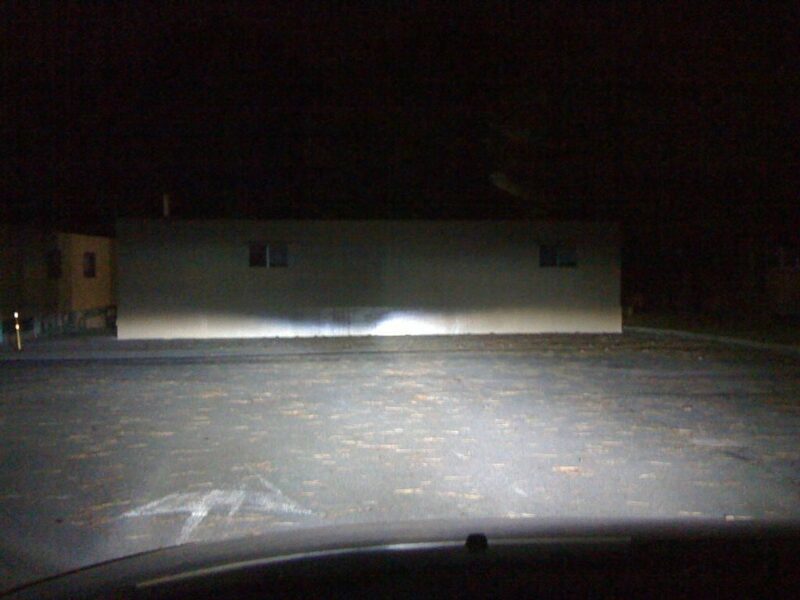 Downsides are lousy cut-off, sub-optimal beam distribution, and no bi-xenon high beam. The cutoff and distribution can be improved by fitting clear lenses to the factory projectors as the stock lenses are textured to reduce filament shadowing – TRS sells the requisite 3″ ZKW-R lenses here. E46 projectors (salvaged from BWM) are a direct swap – you can remove the P1 factory halogen projector and screw in an E46 bi-xenon projector. Examples this one by forcefed on swedespeed or this one on HID planet. Sourcing genuine E46 projectors is getting more and more difficult, and there have been several (low quality) replica batches produced that work their way to eBay other online retailers. Your best bet is to find actual projectors from a salvage yard – but good luck with that! They are in super high demand. 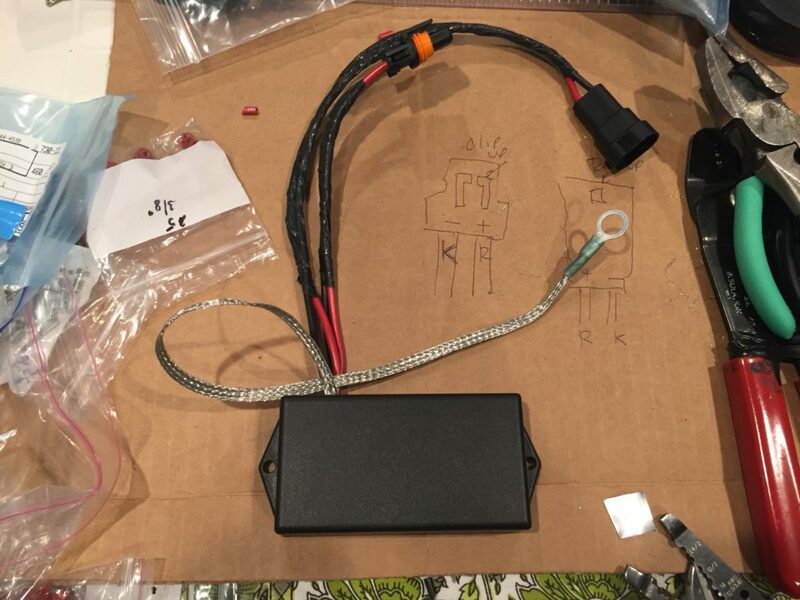 For a retrofit bi-xenon setup, I would recommend going with the Morimoto XB35 (D2S) or Morimoto XB55 (D2S) ballasts for the best performance and lowest EMI, though the back cover might need modification. 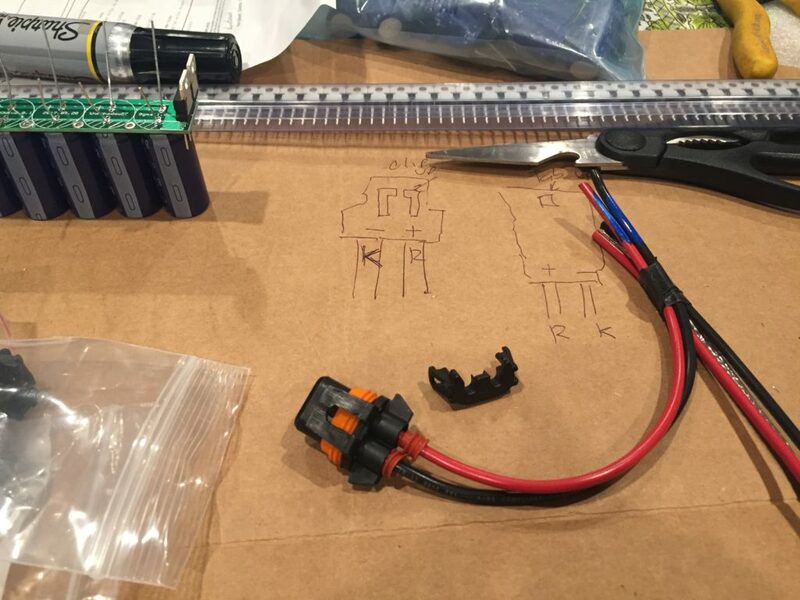 For an easier fit, go with the AMP version of the ballasts and get a D2S -> AMP adapter. You source salvaged (or new, at $800/ea!) FACTORY bi-xenons, and re-wire them to run off of the halogen circuits but you will still need the SKBOWE. The road-following and self-leveling will not work (this has been discussed ad nauseam), and it’s generally agreed that the quality isn’t great. However, the ballasts are included and are actually integrated into the headlight housing, which makes for a cleaner look. This would require a custom SKBOWE setup, please contact me if you are interested in more information. 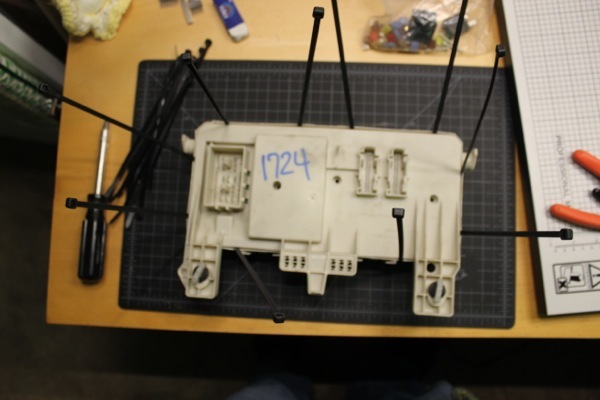 There have been many custom solutions that get the best projectors using adapter brackets. You’re on your own there! 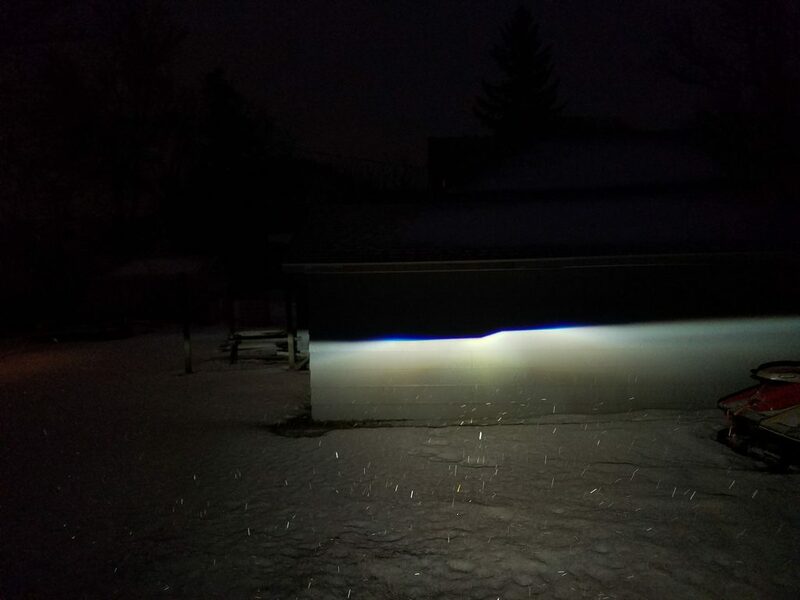 Advantages going with the bi-xenon retrofit route are that it’s by far the best looking light output, distributed correctly, with more light during high beam and a crisp cutoff. Downsides are that it’s much more expensive, may require invasive headlight surgery, requires additional wiring for the solenoid, you’re on your own for aiming, and the replacement bulbs are more expensive. 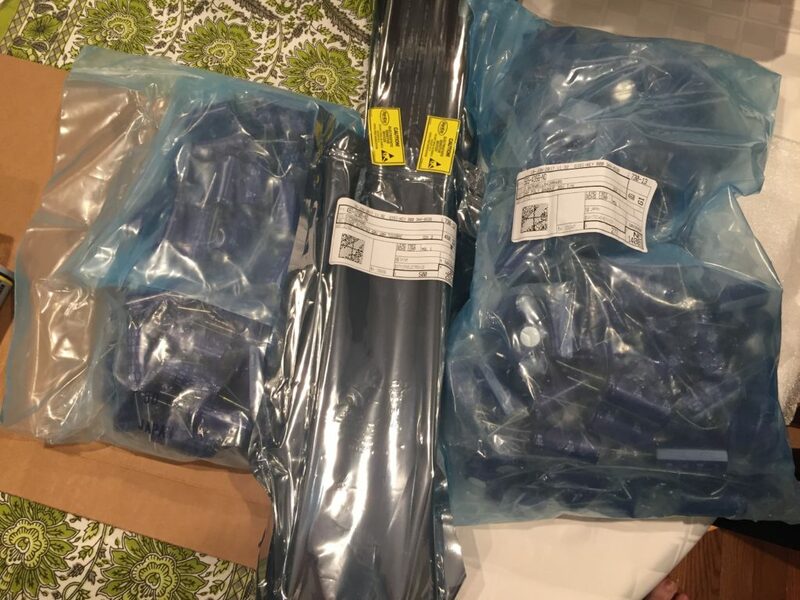 The connectors – 210 sets – made it here all the way from China, and look good! 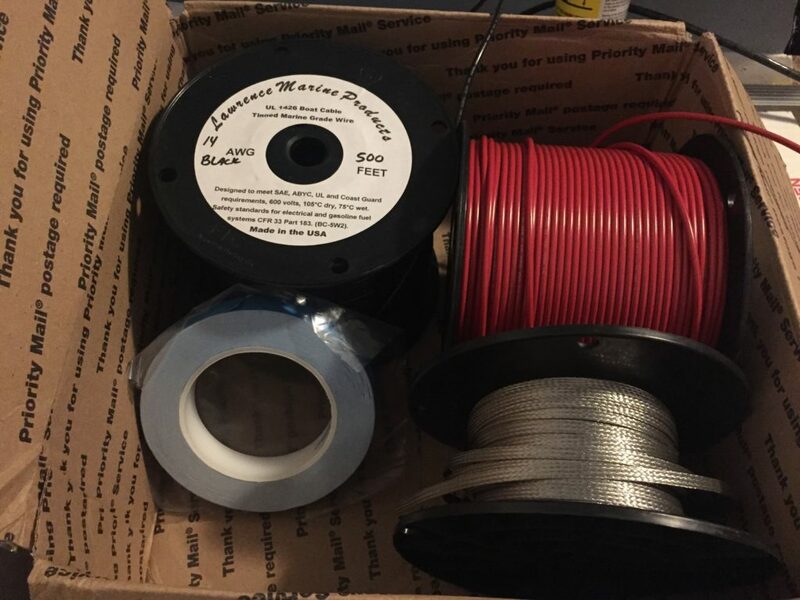 The marine-grade high-strand-count wire (2×500′) and ground strap was also delivered. Still need to order caps, diodes, enclosures, and potting goop. 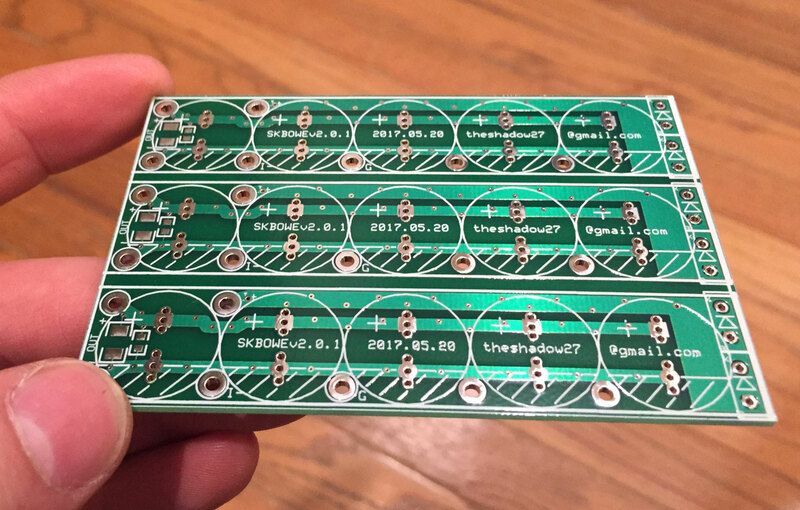 The PCB Prototypes Have Arrived!! This is from the ExpressPCB MiniBoard service, so there are three of them with three copies each, enough to make 4 sets of SKBOWEs. These will be the prototypes, before the main order goes in. New testing has shown that DRL-Disable software (30679690) does disable DRL PWM, but does does NOT eliminate PWM completely. The PWM issue is discussed in detail on the issues page. In effect, when running HID retrofit on OEM wiring, the DRL software update is no safer for the WMM than leaving the LSM in position II at all times. 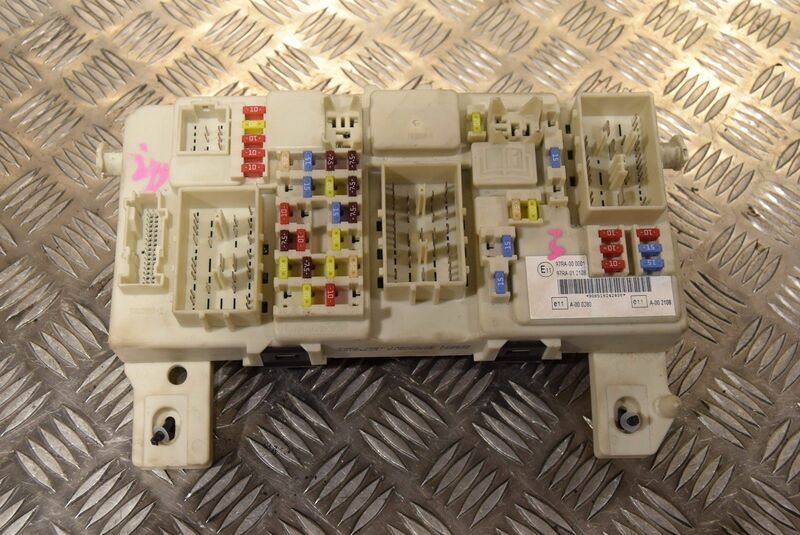 So if you have a retrofit using a BOW3 or similar error code eliminator and DRL disabled, you are on borrowed time! 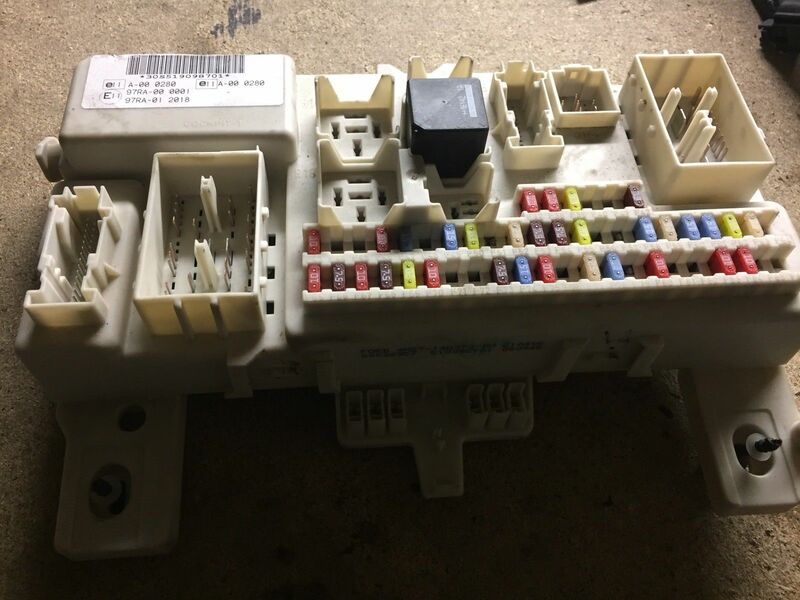 Even if your setup is currently working, I suggest you add additional grounding and inspect/replace the eliminators on a regular basis (3-6 months with 55w, 3-12 months with 35w) to avoid burning out the WMM. Many thanks to Nick0matic and LizardOfBodom for their help in finally systematically establishing the operating parameters of the P1 CEM. The edges of the board are cut with an accuracy of +/- 0.015″. A minimum of 0.020″ blank space is recommended between the perimeter and all features on the board. Traces placed closer than 0.015″ to the board’s edge may be routed off. For the price & turnaround time, as well as based on past experience with them, this is an acceptable compromise. 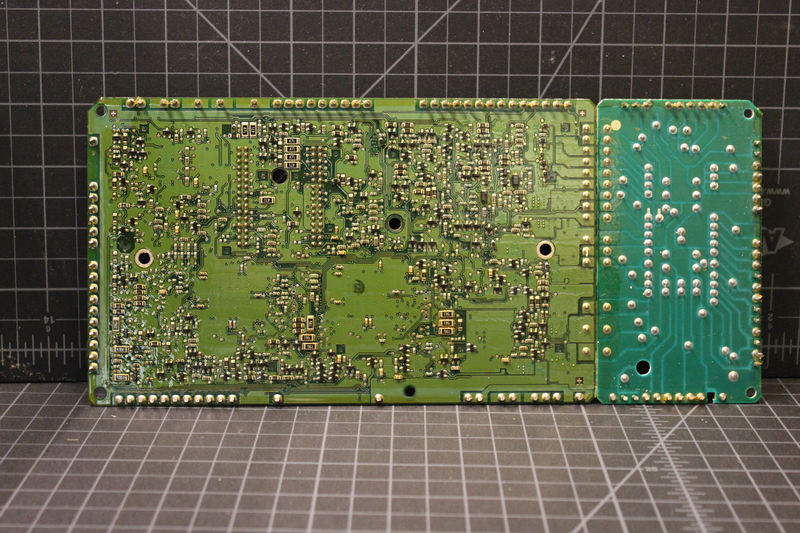 Trying to cram the PCB into the Polycase TF-2409TX will be a tight fit, but I think I’ve got it. The headlights of Volvo P1 vehicles1 are controlled by the Central Electronic Module (CEM), located inside the passenger compartment just below the glovebox. 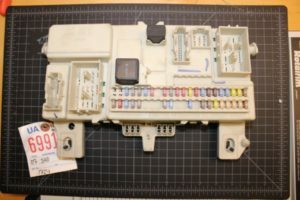 You probably know it as just the “fuse box”, but the CEM is actually a sophisticated computer module that is the backbone of the vehicle’s interior and exterior electrical system. To understand why HID retrofits are so difficult on the P1 chassis vehicles, we must explore how the vehicle controls the headlights. So let’s dive in! 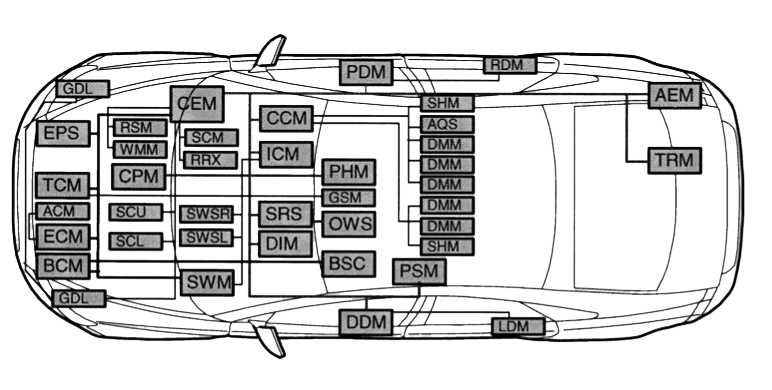 The Volvo P1 chassis has a complicated Controller Area Network (CAN) with many different computer modules that perform all electrical functions from rolling down the windows to running the blinkers to coordinating anti-lock breaking. 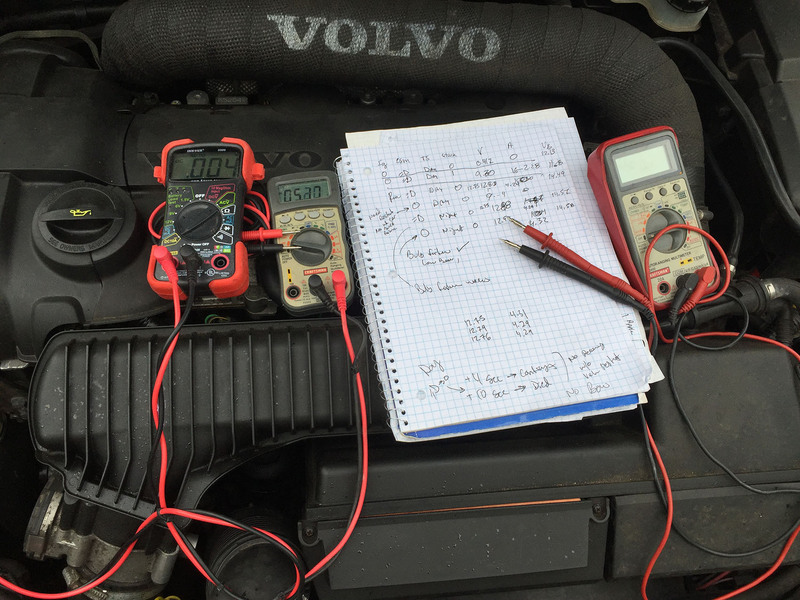 The CEM is the central hub of this network, and communicates with all other vehicle modules over High Speed and Low Speed CAN and with diagnostic tools like Volvo DiCE over the OBD-II connector. The modules chat with a pre-determined set of regular messages compiled by a software called Volcano, which establishes “virtual wires” between modules. At design time, the non-networked sensor (signal), actuator (output) and activation (boolean flag) are defined for each electronic module. The Volcano Network Architect (VNA) design software does a static timing analysis of all signals and their required update rate and packs them into frames which are transmitted in time slots to meet the requirements. When modules need a signal, they get a configuration file which tells the Volcano Target Package (VTP) which frames to decode, and what type of data is in those frames (if a expected signal is missing from the timeslot, the module stores a DTC). For example, if there is an error with one of the headlight circuits, the CEM sends a message to the DIM (Driver Information Module), which then displays the dreaded “Low Beam Failure” warning to the driver. 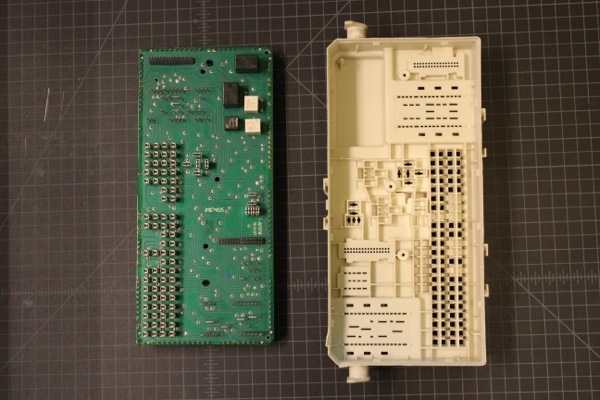 In addition to passing messages between modules, the CEM also directly controls many of the 12V outputs in the vehicle, from interior lighting to climate control. 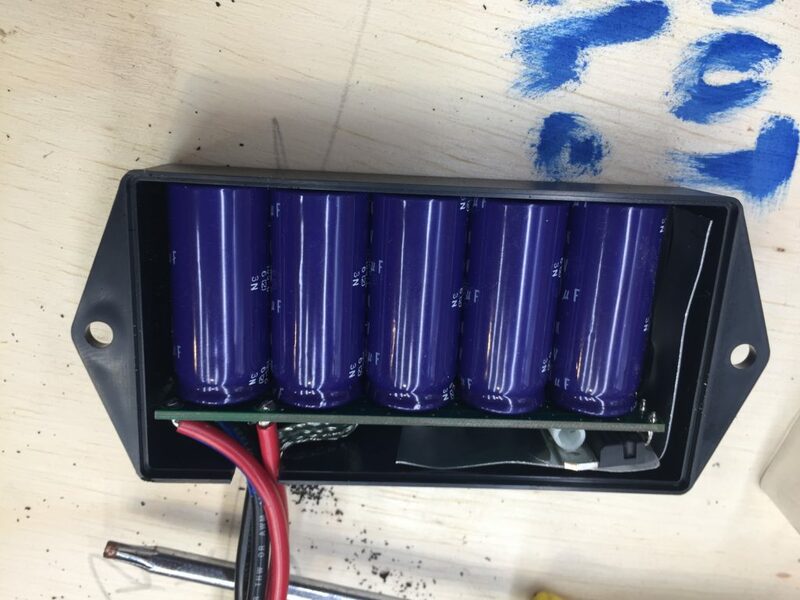 The two outputs we are interested in are for the left and right low beam circuits, which produce the problematic 82HZ PWM signal that prevents HID ballasts from working correctly. It also reads many sensor inputs, like the exterior temperature sensor, the interior climate sensor, headlight switch (LSM) position, and the twilight sensor (among many others). 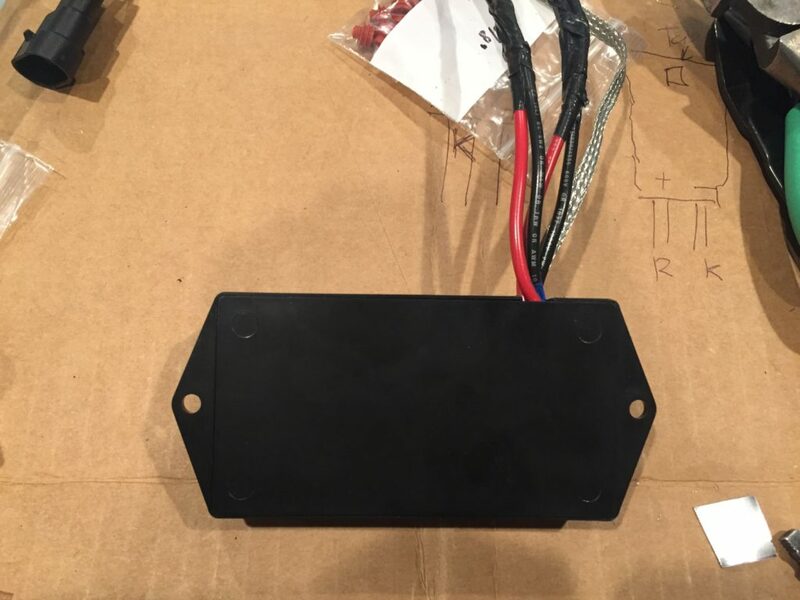 It is the twilight sensor that is responsible for enabling the DRL program that drops the PWM duty cycle down to 50-60%. 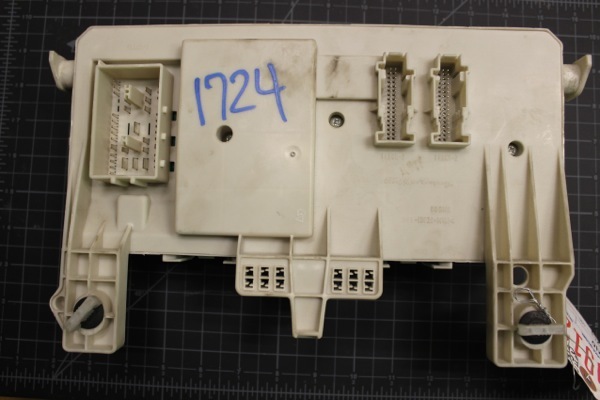 Before now, we knew from the owners manual that there were 7.5A fuses on the headlight circuit, and that there was PWM voltage regulation from the electrical design document, the wiring diagram, and real-world experiments. But beyond that, there was not much to go on in terms of how the thing actually worked. Top view of CEM, as it sits when installed in vehicle. Under the upper plastic cover is the power board, which holds all fuses and relays. It pivots upwards into the space under the glove box, protecting the components from kicking feet. 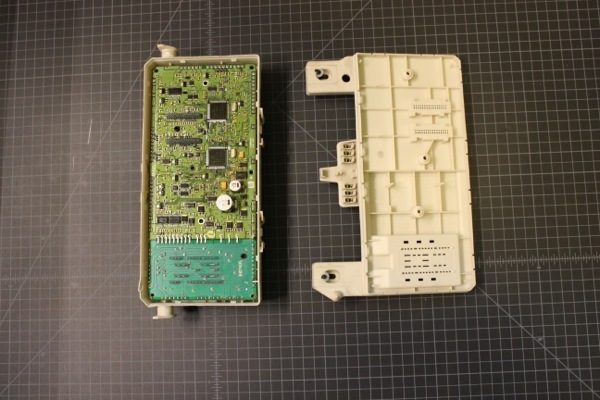 Here is the bottom of the CEM, that you see when looking up at it when installed in the vehicle. Under the lower plastic cover is the logic board. The CEM from the top with all the fuses, relays, and screws removed. We’re going in! In my experience, the best way to open this sort of case without breaking anything is to carefully disengage one locking tab at a time with a thin spudger (or screwdriver). Then, insert a paper clip or zip tie to prevent it from locking back together. Once all tabs are shimmed out, the case just falls apart. Here we see all the zip-ties inserted, ready to dismantle the top and bottom cases. With the bottom of case removed, we expose the multi-layer logic board. 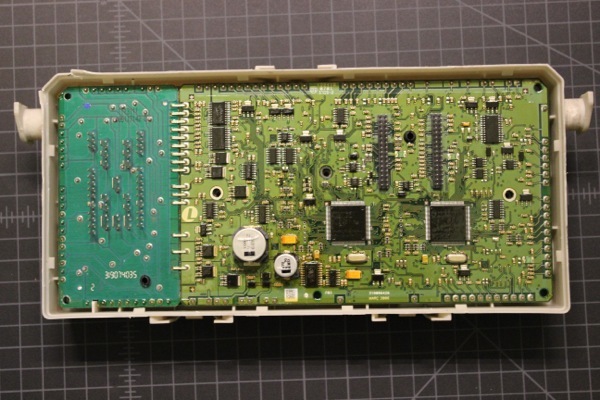 There is a small, 2 layer auxiliary power board for the Floor-1 connector, which is both electrically and structurally connected using thick jumper pins to the logic board. 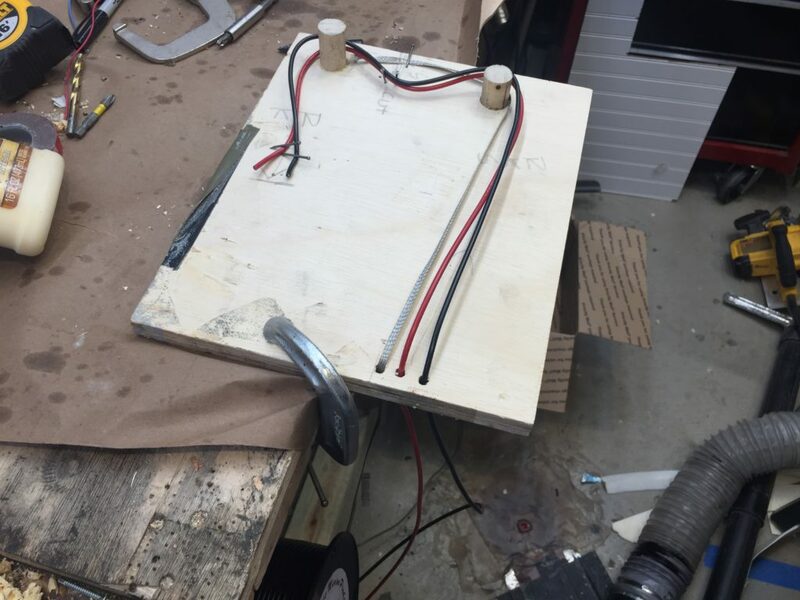 This odd construction is presumably due to limitations on their pick-and-place or reflow setup – or for cost savings by reducing the multilayer area – or for better noise isolation, by physical separating ground planes – who knows… It’s strange for sure. 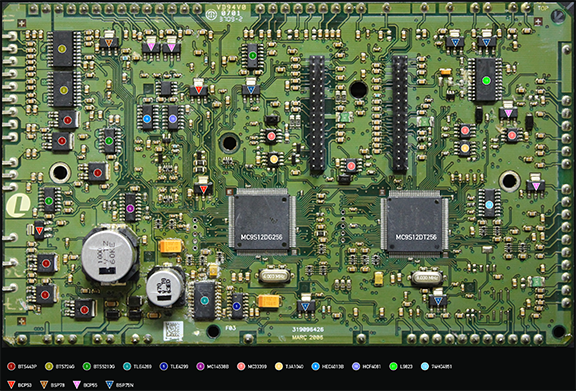 Close-up of logic board side, still in installed in the upper case. 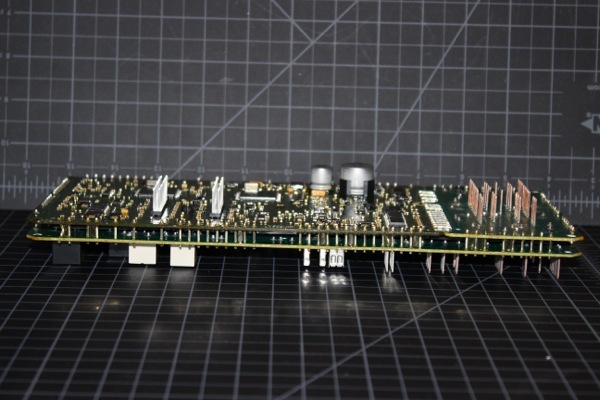 This is a 5 layer PCB (3 layers, 2 planes) with a conformal coating, making it very difficult to follow traces and identify components. 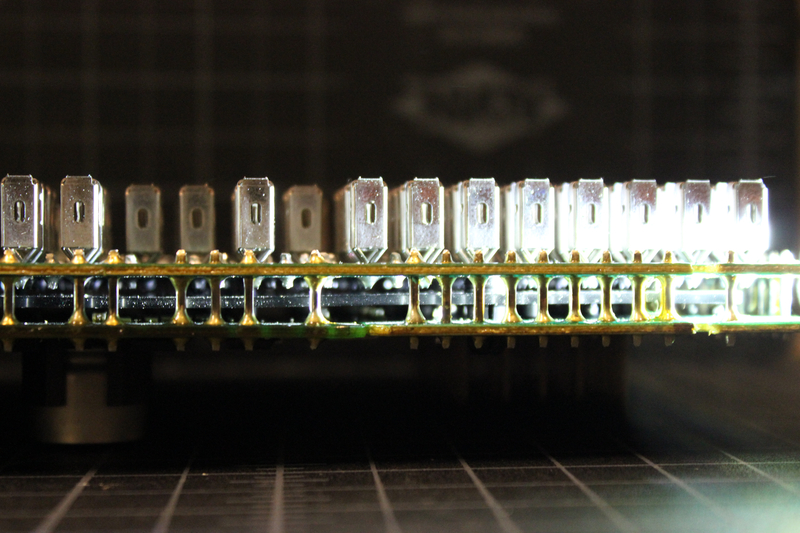 Notice the thick pins around the perimeter which structurally support the board – more on this later. Here is the power side, with the PCB assembly removed from the upper case. 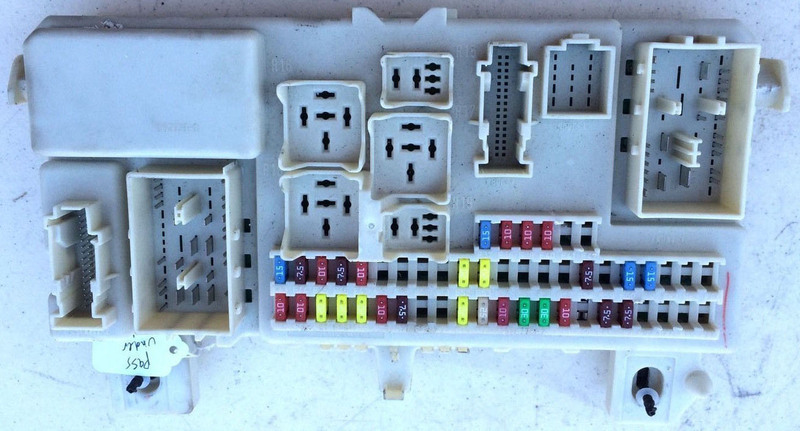 Strange that there are five hardwired mechanical relays (non-replaceable), in addition to the two replaceable relays R15 and R16 – probably a cost-saving measure. The power board has only 2 layers and no conformal coating, so it super easy to follow traces. All contacts are tin plated (rather than silver or gold) as would be expected for an interior component. 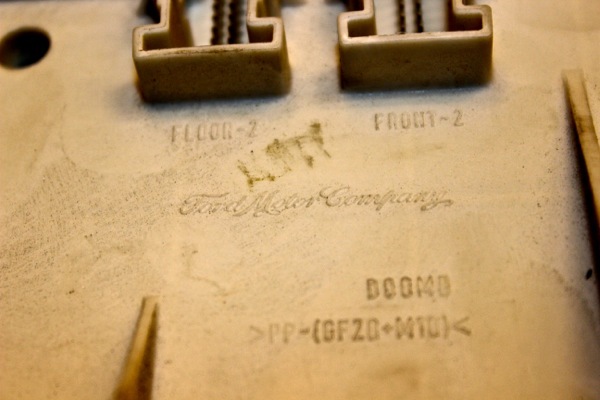 The more expensive platings are reserved for the corrosive environment of an engine bay. At this angle, we see the complete CEM internal PCB assembly as seen from the side. 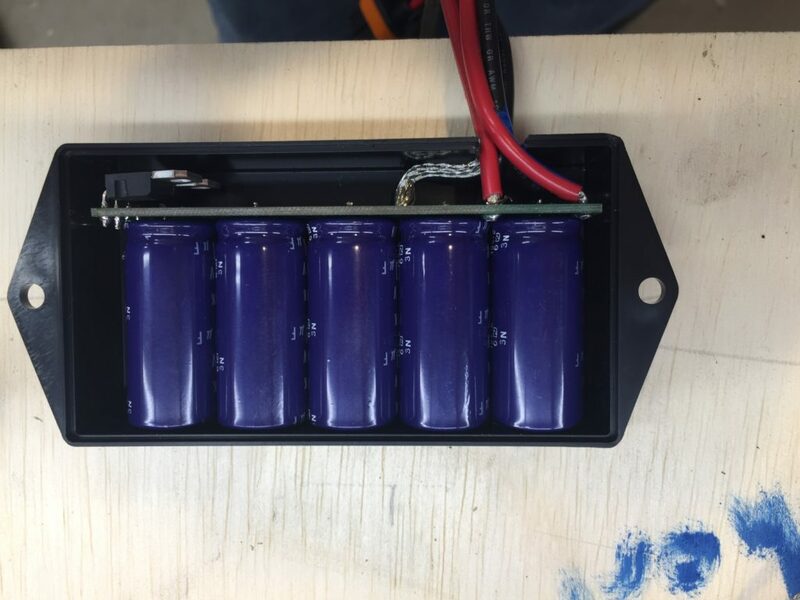 It is a very elegant design, there are no additional connectors or lead wires. 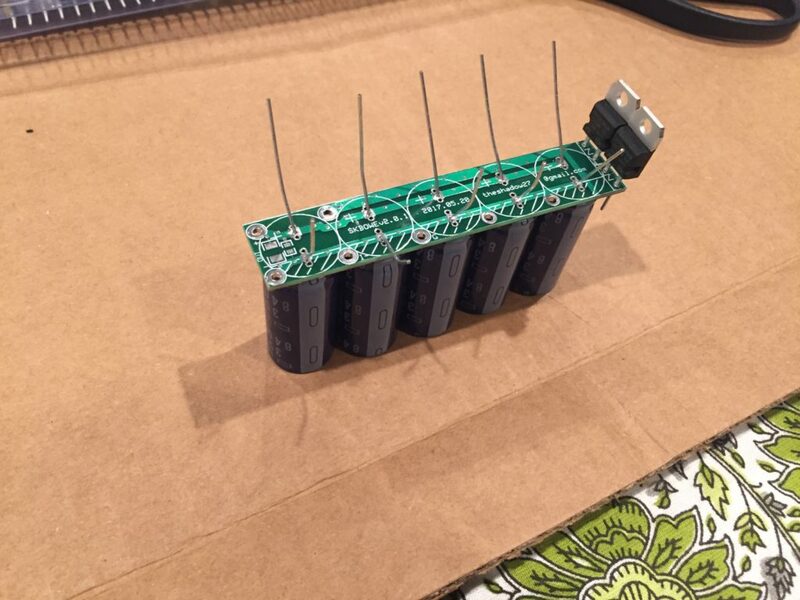 It is entirely self-contained, mechanically self-supporting, and includes all pin/terminal contacts. 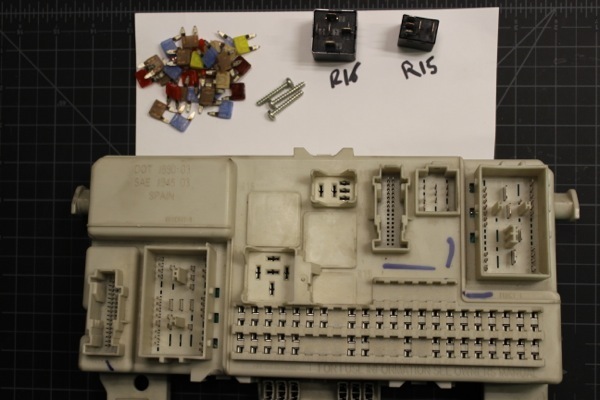 The lower and upper PCBs are structurally and electrically connected using thick jumper wires which provide significant rigidity in both compression and tension, and there is a plastic insulator/spacer which provides some additional compression strength towards the center to prevent deflection when plugging in connectors. A closeup of sandwich assembly shows the insulating spacer and connecting terminals . Now comes the point of no return – slicing the sandwich apart by cutting each of the connecting pins. This allows a view of the reverse of logic board and it’s tag-along auxiliary power board. And the back of the power board – clearly designed by a different team using different layout software – just look at how organic the traces are! Very pretty. All of the parts of the Volvo P1 CEM have been unmasked. This CEM isn’t going back together any time soon. 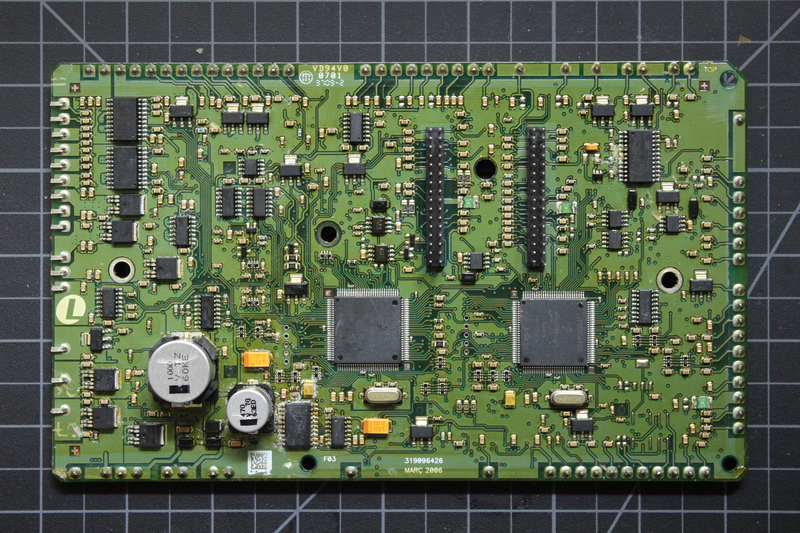 Next, I separated the logic PCB from the auxiliary power board. This is really the brains of the CEM. 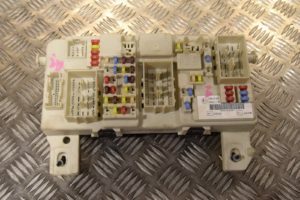 Component Identification – Click to Enlarge! While the tooling, mount location are common, there are major differences in the internal guts – the fuse values are all different, the Mazda version is missing most of the pins which shift between each, relays positioned differently – so it’s not exactly fair to say that the C-platform cars “share an electrical system” in that entire components are the same between makes. However, the 10-year Ford-Volvo-Mazda C1 alliance did achieve a high degree of commonality which helped keep the price of all three lines down. To be clear though, the Ford Focus BCM and Mazda 3 BCM are totally different beasts than the Volvo P1 CEM, both in hardware and software, and only the Volvo C30/S40/V50/C70 need the SKBOWE PWM Filter for HID retrofits when doing an HID conversion. I’m no expert on Ford and Mazda, but from a quick Google search, both seem to work fine with a standard relay harness… Leave it to Volvo to come up with a ridiculous 80Hz PWM Voltage Regulation system.